These are both described in the user manual. Even when developing ECLiPSe code for an embedded application, the ECLiPSe component is best developed and debugged separately using one of these methods. However, it is also possible to use the debugging tools with embedded ECLiPSe code, but in this case the tools have to be explicitly loaded and started, as detailed below. // run the goal:  queens(8,Result),writeln(Result). The environment variables ECLIPSEDIR indicates where the ECLiPSe system is installed, and ECLIPSEARCH is ECLiPSe's name for the processor/operating system we are running on. Other details depend on your operating system and C++ compiler. The tracer stops the program when queens/2 is called, and in this example we have typed an s (skip) and three c (creep) commands. 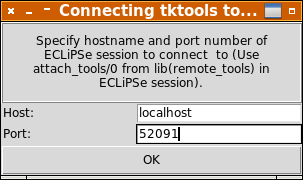 The graphical development tools of tkeclipse can be run independently using the tktools command (part of a standard ECLiPSe installation). They can be attached to any running ECLiPSe code, including embedded code. The program displays a message like the above (containing your host name and a TCP port number), and stops, waiting for tktools to attach. Enter the number displayed above and click ok. Your program should now start running, and the graphical tracer window should pop up, displaying the CALL queens(...) debugger port. The program can now be debugged in the same way as from tkeclipse.